Mao Zedong (Mao Tse-Tung), the son of a peasant farmer, was born in Chaochan, China, in 1893. He became a Marxist while working as a library assistant at Peking University and served in the revolutionary army during the 1911 Chinese Revolution. Inspired by the Russian Revolution the Chinese Communist Party (CCP) was established in Shanghai by Chen Duxiu and Li Dazhao in June 1921. Early members included Mao, Zhou Enlai, Zhu De and Lin Biao. Following instructions from the Comintern members also joined the Kuomintang. Over the next few years Mao, Zhu De and Zhou Enlai adapted the ideas of Lenin who had successfully achieved a revolution in Russia. They argued that in Asia it was important to concentrate on the countryside rather than the towns, in order to create a revolutionary elite. Mao worked as a Kuomintang political organizer in Shanghai. With the help of advisers from the Soviet Union the Kuomintang (Nationalist Party) gradually increased its power in China. Its leader, Sun Yat-sen died on 12th March 1925. Chiang Kai-Shek emerged as the new leader of the Kuomintang. He now carried out a purge that eliminated the communists from the organization. Those communists who survived managed to established the Jiangxi Soviet. During the Second World War Mao's well-organized guerrilla forces were well led by Zhu De and Lin Biao. As soon as the Japanese surrendered, Communist forces began a war against the Nationalists led by Chaing Kai-Shek. The communists gradually gained control of the country and on 1st October, 1949, Mao announced the establishment of People's Republic of China. In 1958 Mao announced the Great Leap Forward, an attempt to increase agricultural and industrial production. This reform programme included the establishment of large agricultural communes containing as many as 75,000 people. The communes ran their own collective farms and factories. Each family received a share of the profits and also had a small private plot of land. However, three years of floods and bad harvests severely damaged levels of production. The scheme was also hurt by the decision of the Soviet Union to withdraw its large number of technical experts working in the country. In 1962 Mao's reform programme came to an end and the country resorted to a more traditional form of economic production. As a result of the failure on the Great Leap Forward, Mao retired from the post of chairman of the People's Republic of China. His place as head of state was taken by Liu Shaoqi. Mao remained important in determining overall policy. In the early 1960s Mao became highly critical of the foreign policy of the Soviet Union. He was for example appalled by the way Nikita Khrushchev backed down over the Cuban Missile Crisis. Mao became openly involved in politics in 1966 when with Lin Biao he initiated the Cultural Revolution. On 3rd September, 1966, Lin Biao made a speech where he urged pupils in schools and colleges to criticize those party officials who had been influenced by the ideas of Nikita Khrushchev. Zhou Enlai at first gave his support to the campaign but became concerned when fighting broke out between the Red Guards and the revisionists. In order to achieve peace at the end of 1966 he called for an end to these attacks on party officials. Mao remained in control of the Cultural Revolution and with the support of the army was able to oust the revisionists. Mao now gave his support to the Gang of Four: Jiang Qing (Mao's fourth wife), Wang Hongwen, Yao Wenyuan and Zhange Chungqiao. These four radicals occupied powerful positions in the Politburo after the Tenth Party Congress of 1973. 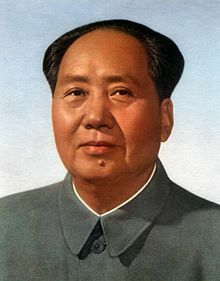 Mao Zedong died in Beijing on 9th September, 1976.